This substantial dish takes just minutes to prepare. Full of flavour, it is surprisingly quick to cook, too. Heat a large, deep non-stick frying pan and spritz with the oil spray. Add the sausages and cook for 3-4 minutes until lightly browned on all sides. Return the sausages to the pan then stir in all the remaining ingredients. Season well. Bring to the boil, then cover and simmer for 30-40 minutes, stirring occasionally, until the chicken is thoroughly cooked and tender and the sauce has thickened. If necessary, remove the lid for the last 5 minutes to reduce the sauce. 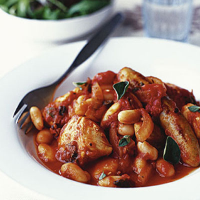 Vary the recipe by adding different canned beans such as kidney beans, or use a different kind of sausage. To freeze the cassoulet, transfer to a freezerproof container, allow to cool then freeze for up to 1 month.